Please, tell me more. I have tried this on several occasions without success. 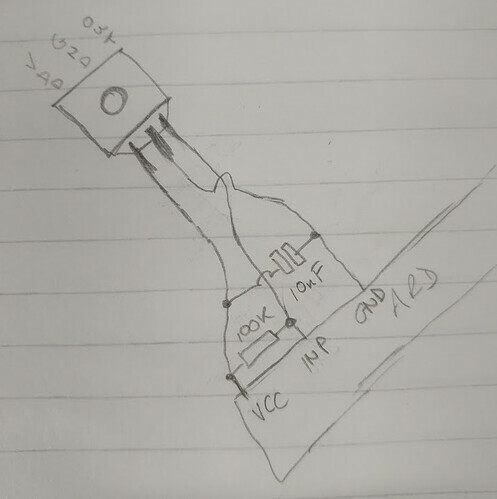 I have a 100 kohm resistor between GND and pulse input and a 10 nF cap between GND and vdd. I extended the sensor on about 1ft of flying lead and used a multimeter across the resistor to find the ideal location for the sensor (currently held in place with tape) where the voltage across the resistor drops from ~2.4 V to 0 V for about a quarter turn of the dial. When my boiler is running at full (heating/hot water) I get about 5 turns of the meter per minute which works out at about 30 kW power. So when I run the gas hob I get about one turn every 2 or 3 minutes, so the power consumption looks like a 6 kW sawtooth when in reality it should be ~2-3 kW constant load. Not perfect, but a big step forward on twice monthly meter readings. Please!!! What sort of meter do you have? I’ve got a strip of them sitting here! That is where I start to get lost. Capable of following a wiring diagram, but what the bits actually are doing is a mystery to me. I’d really want to use a Pi or a D1 Mini I have lying about. (I’ll split this to a new topic). I’m interested in this too, but for reading my water meter. Just checked eBay - wow. £3.49 each, or 10 for £4.20 from RS. Shame I only want 1! As for the circuit, is it something like this? I’ve not built it, that was @cjenkins. of 2.5V to 5.5V and consumes only 24uW with a supply of 3V. I’d say it would be fine. You could buy 10 and sell 9 here at £3.48 each? 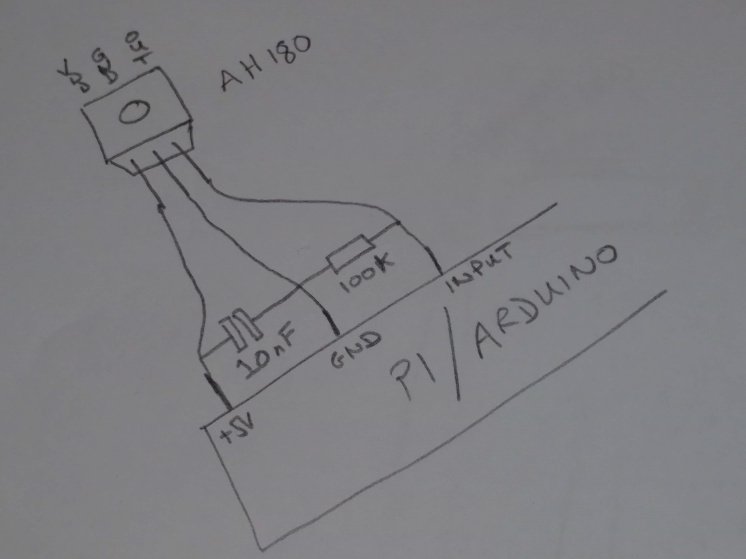 This shows the resistor as a pull-up and the capacitor across the supply for decoupling. Operating conditions: 2.5 V min - 5.5 V max. Hi Lee, yes, sorry I got that. I also note he built it on an EmonTH so probably 3V3 input. It is one area I’d love to make work so I can see how much gas is needed/used for various situations. Robert, you are as usual correct. I was following @cjenkins description, where he’s (incorrectly!?) using a pull down rather than a pull up. Also, AH180’s going cheap, any one interested!? Except you’ve now got your wires crossed! If you look further down the data sheet, the reason for the capacitor across the supply becomes clear. It appears to turn on and sample the magnetic field for 100 (± 25) μs every 100 (± 25) ms, so the capacitor is there to ‘smooth out the edges’ and supply at least part of that current pulse.